When Fiona Theodoropoulos was growing up, Turkish exfoliating mitts were the norm. It was only when she was an adult that she realised that most of the world didn't know about the power of deep exfoliation, and she set out to change this. "I've created Mitten exfoliating mitts as a way to sharing the benefits of Turkish bathing with the rest of the world and into the comfort of people's homes," Fiona Theodoropoulos said today. "Turkish hammams are a truly special experience, and it's my hope that by bringing some of the magic of those hammams into people's homes, we'll start to connect people across the globe through shared skincare rituals." So what are Hammams? Turkish Hammams are one of the oldest bathing rituals in the world. Through alternating between hot, warm, and cold water, hammams encourage detoxification through sweating and reinvigorate the skin and body through exposure to cold water. The most particular part of Turkish baths, however, is the hammam kese, an intense exfoliating massage done with an exfoliating glove. The deep exfoliation peels away dead skin and promotes blood flow, leading to rapid regeneration of new skin cells. It also provides a massage. This luxurious, effective bathing experience is what Fiona Theodoropoulos wanted to bring into everyday life. "There is nothing like hammams available in the market place, so I decided to design and create my own distinct luxury version for men and women all over the world and I called them 'Mitten'. Mitten's range of exfoliating mitts are all designed in Australia and custom made in Turkey," Fiona Theodoropoulos explained. 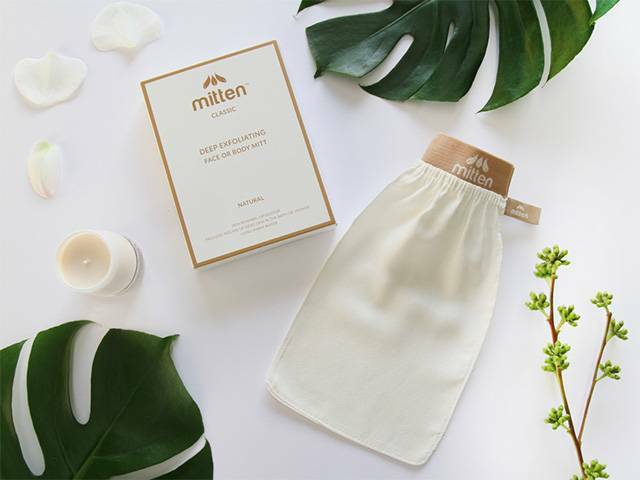 "All of Mitten's range of mitts are crafted out of 100% natural tree cellulose fibres, specially woven to deeply exfoliate in under three minutes, using only hot water. "Our mitts are long lasting and well made, and the experience requires no harsh chemicals or microbead scrubs, making our mittens an ecofriendly, sustainable alternative. Our tag line is 'unveil the skin' and that is exactly what our mitts do. They enliven the skin. Mitten's range of mitts are never tested on animals and come in a range of intensities to suit every skin type. "It's my hope that by going back to these ancient skincare rituals which are highly effective, we can create shared experiences, reduce the level of product we use on our bodies and in the process care for ourselves and the planet, " Fiona Theodoropoulos added. "Mitten truly is one of the most luxurious and effective ways you can refresh and regenerate your skin and the process is simple and easy and doesn't require anything else other than warm water. "Not only does using a Mitten leave your skin looking and feeling glowing, it helps to detox the body and re-energise it as well. "I can't wait for people to truly experience this, and see just how special it is."